Bali is a beautiful and magical island in the southern Hemisphere. Resort is located in the Tuban area, an area most notable for its cleanliness and the Resort is among the Tuban resorts which have pledged their commitment to the environment, local community and the protection of the Balinese culture. 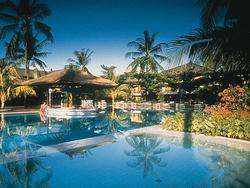 The Tuban beach is located 200 meters away from the resort and it is conveniently located 10 minutes away from Kuta town. Lush gardens surround the walkways leading to the 2 storey buildings of 143 rooms.